Media Coalition Against Galamsey, a media advocacy group seeking an end to illegal mining in the country has called on government to hasten the implementation of the Multilateral Mining Integrated Project (MMIP). He said this would comprehensively address the galamsey menace and sanitize the small-scale mining sector. Mr Ken Ashigbey, the Convener of the Coalition said the operationalization of the MMIP was critical to the fight against galamsey, which continued to pose a serious threat to the lives of millions of Ghanaians. He was speaking at a town hall meeting of stakeholders in the mining industry at Patrensah near Konongo in the Asante-Akim Central Municipality to discuss effects of illegal mining in the country. The meeting brought together chiefs, assembly members, small-scale miners, illegal miners, gold buyers, land owners, civil society organizations, students and representatives of the Environmental Protection Authority (EPA). It was organized by the MCAG in collaboration with the National Commission for Civic Education (NCCE) with funding from STAR-GHANA. Mr. Ashigbey said the MCAG was not against small-scale mining but the wanton destruction of the environment including water bodies by illegal miners. He said though illegal mining had been a national concern for many years; the influx of foreign nationals in the last few years compounded the situation. That, according to him, prompted the formation of the coalition to embark on series if campaigns and advocacy to halt the rampaging effects on the environment. 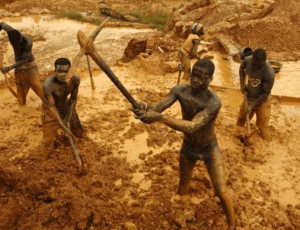 He noted that aside the negative effects such as deforestation, land degradation and water pollution, galamsey sites also served as breeding grounds for prostitution, petty crimes and drug abuse. Mr. Ashigbey said a lot of progress had been made since MCAG was formed over a year ago and called on all the stakeholders to join the fight to sustain the gains. He further entreated the police and the judiciary to expedite the prosecution of offenders, adding that, only 10 per cent of those arrested by operation vanguard had been successfully prosecuted. Nana Osei Darkwah, the chief of Patrensah who chaired the meeting, called for more stakeholder engagement to find a lasting solution to the menace. He indicated that mining was an age-long activity that had been a source of livelihood for many people over the years but underscored the need for responsible and sustainable mining in the interest of posterity.